The documentary is a dramatic and revelatory new account of the final days in Hitler's bunker, based on new access to previously unseen Soviet archives, and cutting-edge forensics. 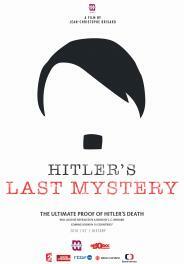 In 2017, after two years of painstaking negotiations with the Russian authorities, award-winning investigative journalists Jean-Christophe Brisard and Lana Parshina gained access to confidential Soviet files that finally revealed the truth about the incredible hunt for Hitler's body. Their investigation includes new eyewitness accounts of Hitler's final days, exclusive photographic evidence and interrogation records, and exhaustive research into the absurd power struggle that ensued between the Soviet, British and American intelligence agencies. And for the first time since the end of the Second World War, authorised cutting-edge forensic tests are carried out on the human remains recovered from the bunker - a piece of skull with traces of the lethal bullet; a fragment of jaw bone and teeth. The documentary is a dramatic and revelatory new account of the final days in Hitler's bunker, based on new access to previously unseen Soviet archives, and cutting-edge forensics. In 2017, after two years of painstaking negotiations with the Russian authorities, award-winning investigative journalists Jean-Christophe Brisard and Lana Parshina gained access to confidential Soviet files that finally revealed the truth about the incredible hunt for Hitler's body. Their investigation includes new eyewitness accounts of Hitler's final days, exclusive photographic evidence and interrogation records, and exhaustive research into the absurd power struggle that ensued between the Soviet, British and American intelligence agencies. And for the first time since the end of the Second World War, authorised cutting-edge forensic tests are carried out on the human remains recovered from the bunker - a piece of skull with traces of the lethal bullet; a fragment of jaw bone and teeth.